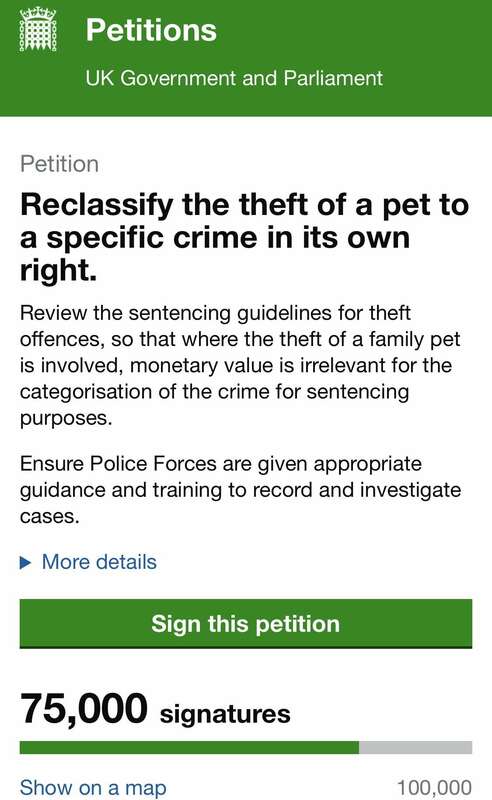 The e-petition to reclassify the theft of a pet as a crime in its own right has now reached over 75,000 signatures. Dr Daniel Allen, a Human Geography tutor at Keele University created the petition in February and he is confident that it will reach the 100,000 signatures required to trigger a debate in Parliament within the six months ending on 8th August. On researching the problem, Dr Allen was appalled by the increase of dog theft, a lack of accurate police statistics and the need for the crime to be reclassified. With the law as it stands, there is no deterrent to reduce pet theft which has increased by nearly 24% over the past three years but prior to the Theft Act 1968 dog stealing was a crime with a custodial punishment. The petition has the backing of the National Animal Welfare Trust, celebrities Ricky Gervais, Miranda Hart, Deborah Meaden and Peter Egan to name a few and MPs. The Stolen & Missing Pets Alliance are asking the support of the veterinary profession to help promote the petition by whatever means to help change the law to deter this vile crime. ← Thieves steal two chihuahua dogs Gucci and Chico from home.